Congenital scoliosis is a three-dimensional deformity of the spine including a frontal plane deviation of the spine caused by malformations of vertebrae and ribs [1Hedequist D, Emans J. Congenital scoliosis: A review and update. 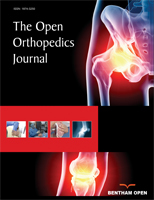 J Pediatr Orthop 2007; 27(1): 106-16. [http://dx.doi.org/10.1097/BPO.0b013e31802b4993] [PMID: 1 7195809] -6Weiss HR, Moramarco M. Congenital Scoliosis (Mini-review). Curr Pediatr Rev 2016; 12(1): 43-7. [http://dx.doi.org/10.2174/1573396312666151117121011] [PMID: 26769614] ]. These malformations can either be failures of formation (e.g. hemivertebrae, wedged vertebrae, butterfly vertebrae), failures of segmentation (e.g. rib synostosis, unilateral bar) or a combination of both [4Winter RB. Congenital Spinal Deformity Lonstein JE, Bradford DS, Winter RB, Ogilvie JW: Moe’s Textbook of Scoliosis and Other Spinal Deformities 1995; 3.-8Kaspiris A, Grivas TB, Weiss HR. Congenital scoliosis in monozygotic twins: Case report and review of possible factors contributing to its development. Scoliosis 2008; 3: 17. [http://dx.doi.org/10.1186/1748-7161-3-17] [PMID: 19017401] ]. Congenital deformities can be very benign to incredibly severe, can result in death from cor pulmonale, paraplegia, and can be associated with multiple other medical problems [4Winter RB. Congenital Spinal Deformity Lonstein JE, Bradford DS, Winter RB, Ogilvie JW: Moe’s Textbook of Scoliosis and Other Spinal Deformities 1995; 3., 5Kaspiris A, Grivas TB, Weiss HR, Turnbull D. Surgical and conservative treatment of patients with congenital scoliosis: Search for long-term results. Scoliosis 2011; 6: 12. [Jun.]. [http://dx.doi.org/10.1186/1748-7161-6-12] [PMID: 21639924] ]. The etiological factors involved in its development are unknown. Basic research has implicated various environmental factors, such as the exposure of the pregnant mother to teratogenic substances, but also genetic factors may play a role [8Kaspiris A, Grivas TB, Weiss HR. Congenital scoliosis in monozygotic twins: Case report and review of possible factors contributing to its development. Scoliosis 2008; 3: 17. [http://dx.doi.org/10.1186/1748-7161-3-17] [PMID: 19017401] ]. Teratogens are classified into four categories, physical (e.g. ionizing radiation or agents that contribute to hyperthermia), chemical (e.g. alcohol, cocaine, thalidomide), or infectious agents and maternal conditions (e.g. malnutrition, diabetes, and thyroid disorders) [9Tantibanchachai C. Teratogens Embryo Project Encyclopedia (2014-01-22) ISSN: 1940-5030 Arizona State University School of Life Sciences Center for Biology and Society http://embryo asuedu/handle/10776/7510 ]. As congenital scoliosis often is accompanied by abnormalities in other systems, we should hence investigate possible anomalies in the cardiovascular, genitourinary and gastrointestinal systems [8Kaspiris A, Grivas TB, Weiss HR. Congenital scoliosis in monozygotic twins: Case report and review of possible factors contributing to its development. Scoliosis 2008; 3: 17. [http://dx.doi.org/10.1186/1748-7161-3-17] [PMID: 19017401] ]. Early surgery is suggested even in mild cases with formation failures in the first three years of life, although there are reports that, in this group of patients, a conservative approach might be beneficial [5Kaspiris A, Grivas TB, Weiss HR, Turnbull D. Surgical and conservative treatment of patients with congenital scoliosis: Search for long-term results. Scoliosis 2011; 6: 12. [Jun.]. [http://dx.doi.org/10.1186/1748-7161-6-12] [PMID: 21639924] ]. Many authors believe that in congenital scoliosis correction surgery should be performed early, before the development of severe local deformities and secondary structural changes, especially in patients with expected deterioration [10Repko M, Krbec M, Burda J, et al. [Simple bony fusion or instrumented hemivertebra excision in the surgical treatment of congenital scoliosis]. Acta Chir Orthop Traumatol Cech 2008; 75(3): 180-4. [PMID: 18601815] -12Winter RB, Lonstein JE. Ultra-long-term follow-up of pediatric spinal deformity problems: 23 patients with a mean follow-up of 51 years. J Orthop Sci 2009; 14(2): 132-7. [http://dx.doi.org/10.1007/s00776-008-1308-5] [PMID: 193 37802] ], but no high quality evidence exists supporting the hypothesis that the side effects of surgery are less severe than the side effects of the natural disease itself [5Kaspiris A, Grivas TB, Weiss HR, Turnbull D. Surgical and conservative treatment of patients with congenital scoliosis: Search for long-term results. 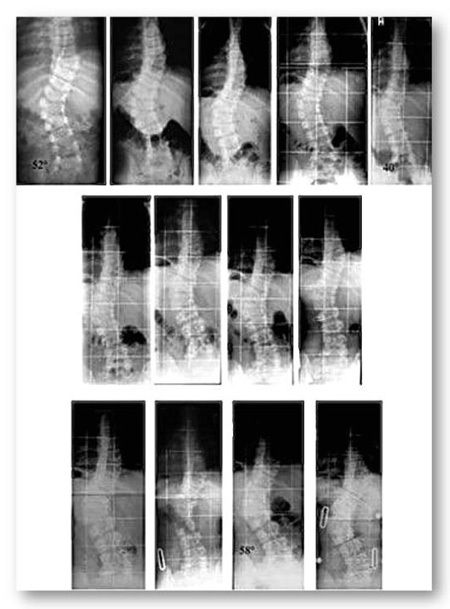 Scoliosis 2011; 6: 12. [Jun.]. [http://dx.doi.org/10.1186/1748-7161-6-12] [PMID: 21639924] , 6Weiss HR, Moramarco M. Congenital Scoliosis (Mini-review). Curr Pediatr Rev 2016; 12(1): 43-7. [http://dx.doi.org/10.2174/1573396312666151117121011] [PMID: 26769614] ]. Cases already have been presented either successfully staying without any treatment or successfully treated conservatively [5Kaspiris A, Grivas TB, Weiss HR, Turnbull D. Surgical and conservative treatment of patients with congenital scoliosis: Search for long-term results. Scoliosis 2011; 6: 12. [Jun.]. [http://dx.doi.org/10.1186/1748-7161-6-12] [PMID: 21639924] , 7Weiss HR. Congenital scoliosis - presentation of three severe cases treated conservatively. Stud Health Technol Inform 2008; 140: 310-3. [PMID: 18810043] ]. The purpose of this case report is to document a long term follow-up of a patient with failures of formation and with a curve exceeding 50° Cobb angle, over more than 20 years. The patient first presented at 18 months old, with more or less balanced failures of formation (hemivertebrae L1 left and T7 right) and a thoracolumbar main curve measuring 52° Cobb. The treatment with a Chêneau spinal brace was started immediately. The actual wearing time was reported at the beginning more than 18 hours a day. While in-brace time was maintained at this amount, the angle of curvature steadily decreased (Fig. 1 ) until age 7, to an angle of 40° Cobb. Between the ages of 7 and 11 years, the actual brace wearing time was reduced to 12 hours per day due to the low growth dynamics. With the beginning of puberty, the in-brace prescription should be increased again to about 20 hours per day. Congenital scoliosis due to failure of formation with a follow-up of 13 years to Risser 4 under conservative treatment with a brace. Patient had failures of formation and a curve of 52 degrees thoracolumbar at the age of 18 months when brace treatment started. The three rows of x-rays show the complete radiological follow-up. The patient at his last presentation with a good balanced posture (left picture with surface topography overlay), the final x-ray (middle) and a picture with the brace on he uses when he has pain (right). During the first five years of treatment (first row), the curve has been successfully reduced from 52° (first row left) to 46° (first row middle) at the age of 3.6 years to 40° (first row right) at the age of seven. Between the age seven to 11 (second row of x-rays) there is no real difference in the follow-up x-rays and the in-brace x-ray (second row on the right) at the age of 11 shows some correction. At 13 years progression back to 50° appeared (third row on the left) and the new brace showed only little in-brace correction (third row middle left). The last brace was made at the age of 15 years at Risser 4, when the curve had progressed to 58° after loss of compliance (third row on the middle right). In-brace x-ray showed no real correction in the mature boy (third row on the right). This figure has previously been published [5Kaspiris A, Grivas TB, Weiss HR, Turnbull D. Surgical and conservative treatment of patients with congenital scoliosis: Search for long-term results. Scoliosis 2011; 6: 12. [Jun.]. [http://dx.doi.org/10.1186/1748-7161-6-12] [PMID: 21639924] ] under the terms of the Creative Commons Attribution License. The patient's compliance failed with an actual wearing time of only 12 hours per day and the curvature increased to 58 ° Cobb at Risser 4 maturity (Fig. 1 ). The sporadic clinical controls were performed with stable clinical findings and the thoracolumbar angle of trunk rotation (ATR) was maintained at 10° at the final assessment review. At the final review and assessment, at 24 years old, an X-ray was taken and a curvature angle of 63° Cobb was measured in the main curvature area. The patient was satisfied with his clinical appearance (Figs. 2 and 3 ) and is generally pain free. Only after vigorous sports activities, the patient reported he feels pain in the main curvature area overnight and the following day. But he also reported he has managed to avoid this pain if he then wears the brace overnight (Fig. (2 ) on the right). The patient reports he has a ‘good’ quality of life. When asked if surgery would be an option for him, he reported that he would not consider this as he is managing his condition well. 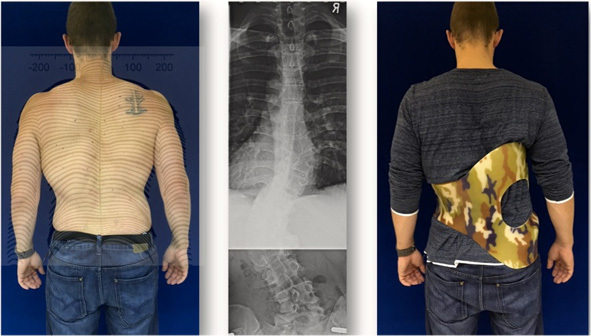 This case shows that, in contrast to the general surgical approach, early surgery for spinal formation disorders is not mandatory in this patient group. Against the background that there is no evidence to date that patients benefit from surgery in the long term, a surgical indication cannot be derived solely on the basis of the presence of a spinal deformity. In literature, we find a case series of patients operated early, which is discussed differently [12Winter RB, Lonstein JE. Ultra-long-term follow-up of pediatric spinal deformity problems: 23 patients with a mean follow-up of 51 years. J Orthop Sci 2009; 14(2): 132-7. [http://dx.doi.org/10.1007/s00776-008-1308-5] [PMID: 193 37802] ]. The authors interpret the results as favorable, even if many of the patients in this study suffered from pain in adulthood and often had to undergo multiple surgeries. Without a corresponding control group, no favorable effect of an operation can be derived from the described case series. Therefore, a collection of congenital scoliosis patients treated non-operatively with long observation periods is desirable. As described earlier, patients with formation disorders can sometimes survive the growth spurt without worsening even without any treatment [5Kaspiris A, Grivas TB, Weiss HR, Turnbull D. Surgical and conservative treatment of patients with congenital scoliosis: Search for long-term results. Scoliosis 2011; 6: 12. [Jun.]. [http://dx.doi.org/10.1186/1748-7161-6-12] [PMID: 21639924] , 6Weiss HR, Moramarco M. Congenital Scoliosis (Mini-review). Curr Pediatr Rev 2016; 12(1): 43-7. [http://dx.doi.org/10.2174/1573396312666151117121011] [PMID: 26769614] ]. The patient’s trunk scan at his last presentation with oblieque views showing only slight cosmetic disturbance. In the present case with a curvature of more than 50° at the age of 18 months, it can certainly be assumed that brace treatment initially prevented a progression of the curvature in the early growth phase (age 1.5 - 6 years). There has even been a clear curvature correction (Fig. 1 ). The fact that a premature reduction of brace wearing time chosen by the patient during his adolescent puberty has led to a slight progression, suggests that this case was a progressive scoliosis. It is therefore probable that brace treatment may have prevented an increase in curvature beyond the existing extent. In this case with a curvature of more than 60° Cobb, more than 22 years after the start of treatment (Fig. 2 ), the patient experiences a ‘good’ quality of life, a life that does not seem limited despite the curvature of this magnitude. These types of cases raise questions of the general indication for surgery for patients with congenital scoliosis. For example; should Cobb angle magnitude be the only basis of indication for surgery in congenital scoliosis? Cobb angle and the number of degrees alone can not serve as the only indicator of the condition of the patient (Fig. 3 ). Furthermore, one can rightly claim that, according to the current study, there is no significant evidence that patients benefit from surgery for failures of formation. With regard to the operation it is not the initial magnitude of Cobb measurement, but the individual prognosis which is of importance. Smaller deformities according to the author's experience are often also stable during the pubertal growth spurt [5Kaspiris A, Grivas TB, Weiss HR, Turnbull D. Surgical and conservative treatment of patients with congenital scoliosis: Search for long-term results. Scoliosis 2011; 6: 12. [Jun.]. [http://dx.doi.org/10.1186/1748-7161-6-12] [PMID: 21639924] , 6Weiss HR, Moramarco M. Congenital Scoliosis (Mini-review). Curr Pediatr Rev 2016; 12(1): 43-7. [http://dx.doi.org/10.2174/1573396312666151117121011] [PMID: 26769614] ]. 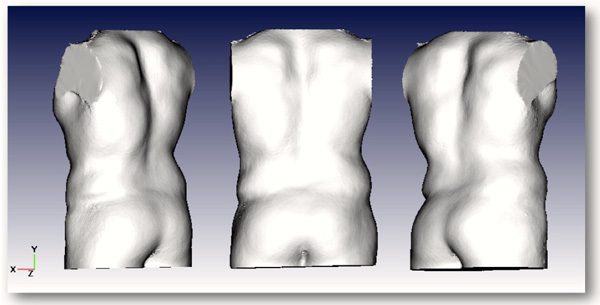 Larger curves (> 30 °) with formation defects should be treated early with a suitable brace before considering surgery. However, unilateral segmentation disorders (rib synostosis, unilateral bar) involving more than 3 segments are only accessible to brace treatment as exceptions. Here, early surgery is usually required to mitigate the sometimes fatal prognosis, even if the complication rate in these patients is not insignificant [5Kaspiris A, Grivas TB, Weiss HR, Turnbull D. Surgical and conservative treatment of patients with congenital scoliosis: Search for long-term results. Scoliosis 2011; 6: 12. [Jun.]. [http://dx.doi.org/10.1186/1748-7161-6-12] [PMID: 21639924] ]. Patients with formation disorders should not undergo early surgery without attempting high-quality brace treatment. These patients may have a nearly normal quality of life in adulthood with full participation in all activities, when the curvatures are balanced even with a high angle of curvature. In the case of long, one-sided segmentation disorders, surgery should be considered early. Written informed consent for publication of the patient's information (X-rays, photos, records, etc.) has been obtained from the patient. HRW is receiving financial support for attending symposia and receives royalties from Koob GmbH & Co KG. The company is held by the spouse of HR Weiss. DT reports that she currently works for an orthotic company in the UK supplying spinal braces. Winter RB. Congenital Spinal Deformity Lonstein JE, Bradford DS, Winter RB, Ogilvie JW: Moe’s Textbook of Scoliosis and Other Spinal Deformities 1995; 3.